Or breaks the panels so badly that she falls out of the book. You should read issue 17. I think she would want people to read her book, since every month said book isn't cancelled is another month she gets to stay alive (and not get killed off as a nameless extra or in an event). Exactly what's the concept behind this book? I like the artwork, by the way. 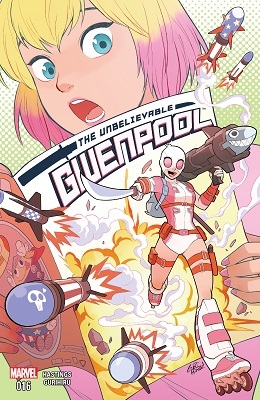 Basically Marvel did a series of Deadpool-themed variants and the one for Spider-Gwen was such a big hit with fans that they made it into its own character. 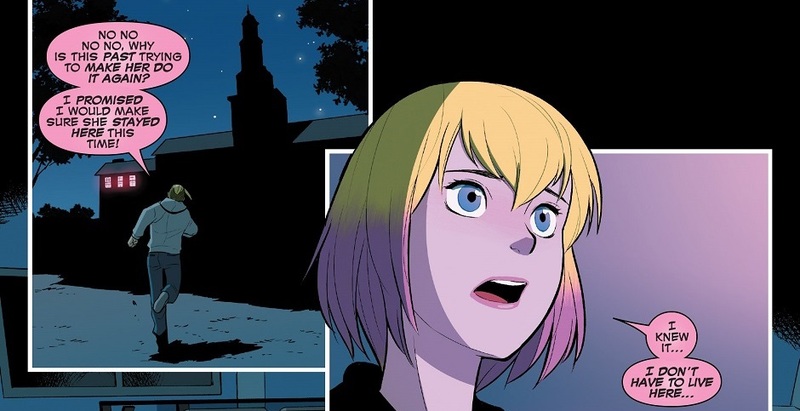 However she's not related to Gwen Stacy OR Deadpool, her name is actually Gwen Poole (probably so the rights wouldn't go to Sony or Fox). Her schtick is that she's from 'our' world so she's wary of what goes in on in Marvel comics when she interacts with other characters. I thought it was Gwen-themed variants and the Deadpool one was the hit. Yeah I might have gotten the two mixed up Marvel does so many of these variant gimmicks. The zombie variants came after the main series. 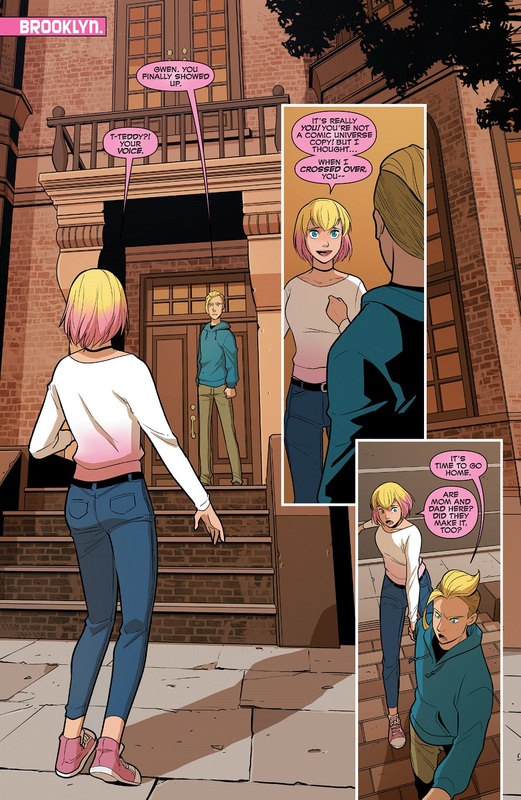 Gwen Poole is a big comic book geek from "our" world (where MARVEL properties and characters exist only in fiction), who one day finds herself in the regular MARVEL Universe. She decides to make a name for herself as a costumed vigilante using her insider's knowledge of comic stories, tropes and characters to help her on her assignments, foguring that of she manages to stay the star of her own book she can avoid being killed off like a namless civilian. 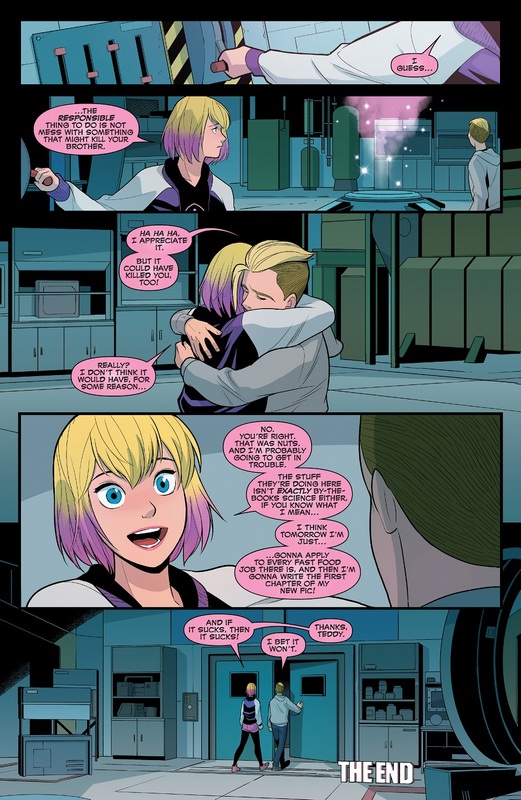 The alias Gwenpool came about because her costume designer mistook her name (Gwen Poole) as the identity she wanted to take. Behind the scenes, though, she was invented for a Gwen Stacy themed variant cover for Deadpool's Secret Secret Wars, and proved to be popular enough that she was developed into an actual character. Spider-Gwen is the Spider-Man of another earth, where Gwen Stacy was bitten by the radioactive spider and Peter Parker became the Lizard before his tragic demise (among other things, Matt Murdock is a crime boss, Frank Castle still works for the police and X-23 is Wolverine instead of Logan). 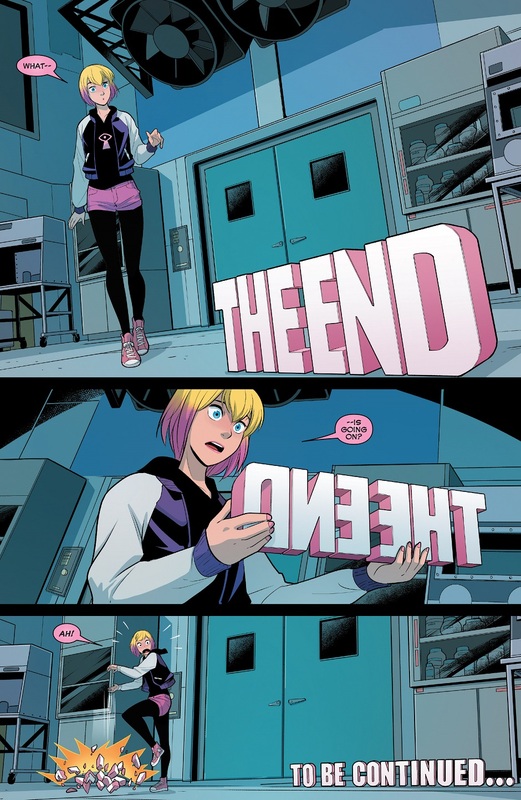 The character was created for and introduced in the 'Spider-Verse' crossover event, and (like Gwenpool) proved popular enough that she ended up getting her own book. She's a girl from the "real world" who suddenly found herself stuck in the 616 comic book world. She realized that nameless nonheroes and background characters are more likely to die, so she's using her knowledge of the genre, tropes and plot contrivances, to act like she's the star of her own book. And now she seems to have gone home. But thats part of the comic book now too. 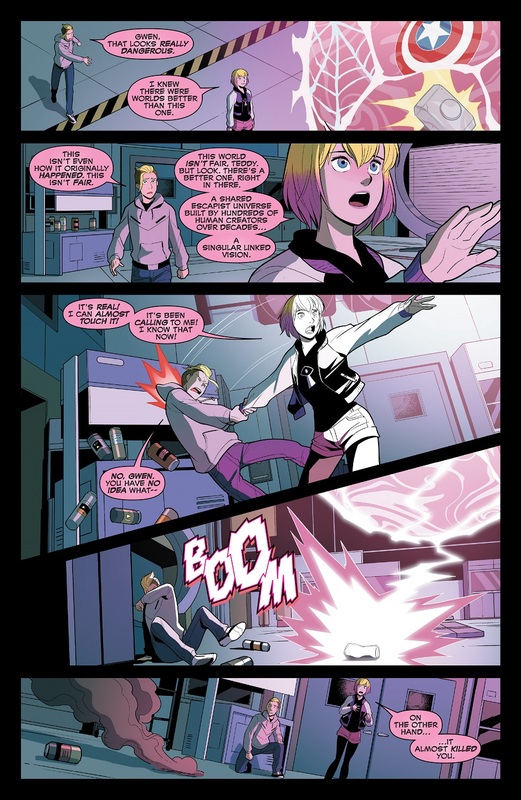 Of note, Gwen does not have any powers, nor does she have any meaningful fighting skills. Buuut she's genre-savvy enough to know that the star of a comic book gets Plot Armor and liberal Deus Ex Machinas, and exploits those to come out on top. Real world comic fan stuck in the Marvel Universe. I really like this portayal of her family. The contrast between sincerely wanting to be loving and supportive (even the "mean" one still took care to learn about her interests like namowrimo, and it looks like he really hoped she could channel her love for fannish things into getting out of her funk), and the frustration and anger when somebody you love keeps going on a self-harming loop and nothing works to break them out of it. 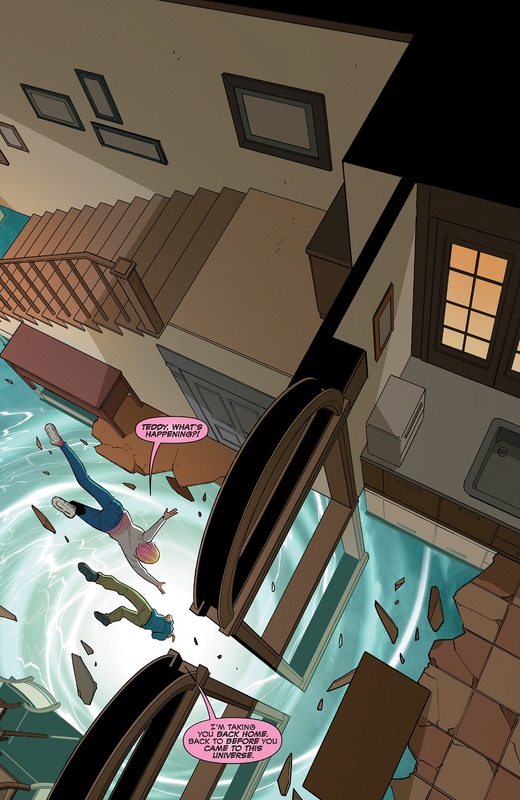 Also, it's a small detail, but I really like the reveal that the pink bubble is how all people of her world speak. I think that was explained by Doctor Strange in #3 as being her multiversal 'accent' of sorts, acting as a tell for where she came from (like how the Maker speaks in a lowercase font while everyone else's words are capitalised). Hickman also did that with the Ultimate Universe being signified by its font (specifically being the early 2000s font with upper and lower case letters versus the more traditional block letters).